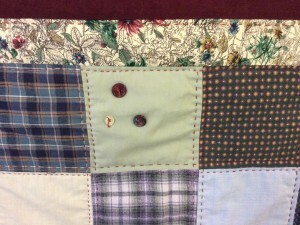 Sue made her ‘memory quilt’ from her dad’s clothes, it is machine pieced and ‘naïve’ hand quilted. She talks about when she first started quilting when her son went to school, about 30 years ago, and the friendship she’s enjoyed through quilting over the years. Sue talks about being a Cornish quilter, including the challenges of travelling around the region, well-known local quilters and local groups. Amanda Davidge [AD]: This is Amanda Davidge talking to Sue Mellis, in St Austell Cornwall, on the 18th of January 2016, at Sue’s house in St Austell. And, Sue, ca… we’re going to talk today about [noise] your special quilt. Could you tell me something about the quilt that we’ve got here? Sue Mellis [SM]: Yes, Amanda. This quilt was made, and I do call it my memory quilt, it was made from bits and pieces of my dad’s clothing. My dad died and I was his carer and I couldn’t possibly bring myself to throw everything away so being a fabric lover I kept all the bits, and then I made this tiny, little lap quilt. And most of it is from his shirts and his pyjama tops, and when I feel I wanna be close to my dad I take it out and I give it a little cuddle. AD: Aw. What did you… How long ago did you make it? SM: Ooh, back in two er 2002 I think it was, yes, it was 2002. AD: Ah. And what kind of quilting? 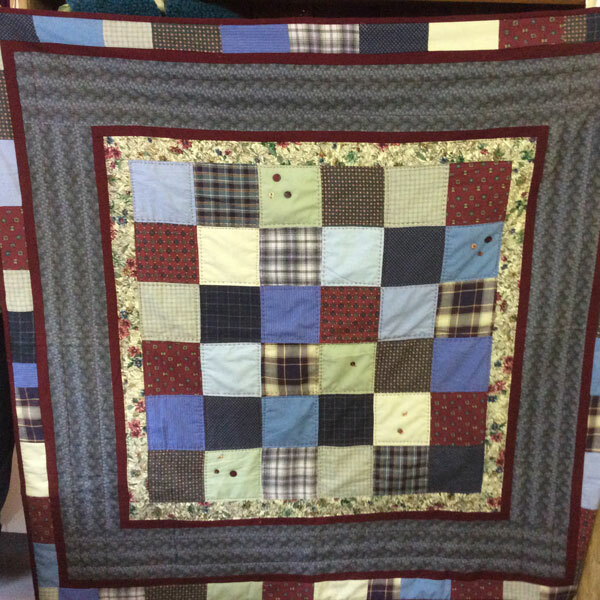 How did… Did you do machine quilting or is it hand? SM: No, I do all my quilts, I, I piece the bits together on the machine, and all the quilting is hand done and it’s just ordinary polyester wadding, so I thought it was easy to, to wash it when I needed to. And I used that scrap fabric for the back. AD: Ah, right. And with the… How did you quilt it? What, what did you… you quilted it by hand? SM: Yes, it’s what they call naïve quilting which is bigger stitches and I did it with pearly thread which is slightly thicker than the, the quilting thread. AD: Ah. And what… Did you have a pattern in your mind? SM: No. No, I just cut the pieces up and put them together randomly. I thought the best way to, to do it really. AD: And since you’ve made this quilt was this the first quilt you’ve made? SM: Oh gosh, no I’ve been quilting for years, since my eldest son went to school right from the age of four I joined a little patchwork group. And I couldn’t tell you how many I’ve made but it’s dozens of quilts I’ve made. So I think it was… I’ve been doing it about twenty eight, twenty nine years, so I’ve got quite a few. And wall hangings, dozens of wall hangings, so it wasn’t my first [laughs]. AD: So you couldn’t say how many quilts you’ve done? SM: No. No, I suppose, oh, 25, maybe 30, ’cause a lot of those I’ve given away, and the same as wall hangings, you know I’ve just lost count. I just make them for pleasure and then give them to people who I thought would appreciate them. AD: So can you tell us something about what made you start quilting? SM: I started quilting with a friend that I met at keep-fit, and she was joining this little, this quilting group at St Blazey Gate and she said, ‘Why don’t you come along?’ and I thought, ‘Oh I don’t know. And then my child’s at school. Do I, I want a bit of freedom.’ But I did go along and I quite enjoyed it! And all the ladies that were there that took part were very nice, they’re very, very helpful, and so that’s why I really started. But once I started I couldn’t stop. That is the trouble with quilting as all quilters will tell you. I get a lot of pleasure from it, a huge amount of pleasure. And I think the most I’ve got out of quilting really is the friendship. You know some of the quilts we, we do as a, as a group, and not individually and we do a lot for charity, we’ve raised thousands and thousands of pounds in both groups that I belong to for local charities, and it just, just makes you feel good to think that you’re doing something for someone else and through something that you, you love doing. SM: So, yeah, I’ll keep on doing it until the eyes go I think [laughs] and then, then I’ll have to stop. AD: So what kind of quilting do you do? SM: Traditional. I’m, I am a traditional quilter. I used to piece them all by hand, but then I found it was taking too long so I do piece them on the machine, and then I hand quilt them very fine, with very fine quilting thread, all in the natural colour. I try and keep it as traditional as I can. But I have gone in a bit more recently for linens, because I always, always used cotton the whole time. But when I started we couldn’t get cotton, it was polyester, all polyester, which some of us used but not good. And there wasn’t any quilting shops down, down in this area, none at all, so we were always going off to jumper sales, [laughs] much to my husband’s horror, and buying shirts and anything we could get or skirts, anything, bringing them home, taking them to bits, washing them, cutting them up and then putting them together into quilts. So that’s, that’s really how it all began for me. Of course now I don’t do that, I just go to all these fabulous quilt shops and see all these wonderful fabrics and buy them really because I like them. I don’t always use them all so I’ve got, I’ve got quite a few metres of fabric I’m afraid [laughs]. 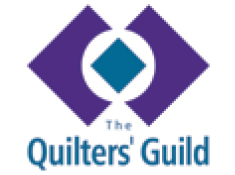 AD: Do your quilting groups that you belong to do they hold any exhibitions and, and if they do what, what, what… how often and what are they like? SM: Yes, both groups have exhibitions and, fortunately, one group is one year and then the other group is the next year so I’m able to help and attend on both of them. We make… both groups make two quilts to, to raffle as the first and the second prize and then you’ve got various things like cushions that we make that are also for prizes. It’s always a joint effort. You get those that machine who are really good at it, they put all the machining together, and then you get a few that’ll want to design it, or they get the design out of a book and we copy it, and the rest of us all work on it through quilting, so most of the group all have something to do with it. And then we have the exhibition, usually run over three days. It’s har… very hard work, as anybody’ll tell you, but it’s worthwhile. And then when we finish a week later, we see how much we’ve raised, how many thousands, and although we say at the time we’re not gonna do another one we always go ahead and do another one so it’s lovely. So I’m fortunate to be in two groups and help raise a lot of money, which is very good. AD: Wow. Gosh. So… you specialise in hand quilting and you’re… and the traditional quilting. Do you find that there are many people in your groups who do the same? H… What kind of quilting do they do? SM: Yeah, it varies. In one group there’s a lot more machining come into it. A lot more. But they also do a bit of hand. And then you get what I call the old school, ones that are possibly more of my age and, and not worried about doing a quilt to go into an exhibition or whatever, they do the hand quilting, and they may not do a full-size quilt anymore. And I suppose now they’re of a generation that have got grandchildren, great-grandchildren, they’re making nap quilts and cot quilts, but they still quilt those by hand, the majority of them, which r some of them will splash out and have these wonderful people that do this longarm quilting. It will design a pattern and it’s all done on a machine. They are lovely, they’re beautiful, but to me I still like to see the hand quilting. That’s my thing. AD: Mm. Are there any other quiltmakers in your family or in your history of your family where you might have got inspiration or influence? SM: No, not that I know of. No. No. My mum, bless her, she always worked and had… she had seven children, but she was always knitting, but that was clothes for us to wear of course. But, no, I think she dreaded having to put the shirt buttons on, [laughs] she was never a sewer, so where I’ve got it from I don’t know. No idea. Oh I’ve got a sister that took up cross wor… cross-stitch for a while, but she doesn’t do it now. But, no, as far as I know I’m the only one. AD: Sue, what… Have you been to any workshops or quilting courses and if so who is your… which ones did you like the best? SM: Yes, I’ve been to several over the years. I go to Jo Colwill at Cowslip Workshops, and they’re very enjoyable because Jo is so helpful, very generous and kind, and she’s very good, if you’re a bit slow to understand something she [noise] gives you endless time, she goes through it time and time again, and also it’s a lovely place to visit to go and I’m sure a lot of ladies do know that. But that’s my favourite I think, Jo’s. Also Sa… we’ve got Sally Snapes now that used to Coast to Coast just selling fabrics, but now she’s got a lovely works… workshop and a shop, and I have been to a couple of Sally’s but not quite so many as I have at Jo’s. But also Sally is very helpful and the girls that work for her. AD: Mm. And what did you [noise] learn when you were on your workshops? SM: Different things. One was for quilting to show you how… the best way to quilt, to start and to finish, which is quite important really, to end off your quilt. Also the best way to do your borders, always making sure that you measure from the centre of your quilt out [noise] and not down the side otherwise you’ll have a wobbly quilt. It’s that sort of thing I think to detail the things that I do. Or appliqué. I learned to appliqué with Jo which I used to love but don’t do so much of it now. Or various things really. And, Sally’s, I’ve been to a couple to make dolls, and li… these little people, which I’m very fond of, they’re lovely. And also Sally’s a very good, very good teacher, so we’re very lucky now to have both of those in Cornwall. AD: Mm. And are there… is there anybody in the quilting world that you really like, would you say, as an influence on your work? SM: Um. Lynette Anderson I quite like because I like her, her fabrics. Sh… I love… Her fabrics are my sort of thing. And I’ve got a couple of her books. Yes, I would say Lynette Anderson. And I was [noise] lucky to go to a talk with her at Jo Colwill’s at Cowslips. A lovely lady, very interesting, very interesting, and the way she started from nothing, and the whole family, even her husband and sons, are all involved in it. There again, very helpful, lovely teacher. Yeah so I’d say Lynette Anderson’s the one that I, I look towards. AD: Mm. And what do you think are the problems of quilters, for quilters in Cornwall being as far away from the main thrust as we are? SM: Yeah, yes I suppose, yes trouble is with [noise] Cornwall being so far down it’s getting to these places, the cost of it really, that that’s the thing. You seem to spend most of the day travelling and less time there which is a shame. Yeah I would say it’s, it’s the distance, that’s, that’s our, that’s our problem, because then of course you’ve got costs. 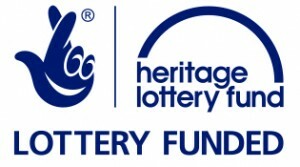 We do have coach trips that will take us up, but there again it’s a very early start and late getting back and, and sometimes it’s you think is it worth going that far? It… Yeah that’s the problem, it’s the distance to get to them; too far away for us. AD: In your quilts do you have a main sort of colour that you always get drawn to? And you mentioned linen fabric. Is… What, what is the kind of colour and the, the… the maybe the pattern that you would use mainly in your quilts? SM: Yeah. Pa-patterns is traditional. I like all the traditional patterns and I’ve done a terrific amount of them. And, and the methods, like the appliqué I like, and cathedral windows, all those sort of designs I’ve done. But for the colours I’m… I don’t like anything too bright, I’m not a bright person, so I like subtle colours. And they vary but linen I like but I love those neutral shades. That is my, that’s my favourite really, the neutral shades, and then of course you can a-add something to it brighter if you want to but I do like the neutral shades. That’s my, that’s my thing really. AD: Where… Do you have a special place that you do your sewing? SM: No, not really. In the winter I tend to go in the kitchen ’cause it’s warm by the Aga, that’s, [laughs] that’s why I use the kitchen. But wherever the light’s good really that’s I, that’s where I’ll sit and quilt ’cause I do need to have good light. Don’t sew in the evenings as much as I do although I’ve got a good lamp and I could do that but, I just find that I’d, I’d rather sew during the day really, preferably afternoons, that’s when I sew. AD: And how much time would you say that you spend sewing? SM: Ooh it varies really. Depends how much pressure I’ve got to finish something, ’cause once I start something I sort of s… I’m very good at the beginning, then I’ll have a lull and then I’m panicking to finish. So I suppose if I, if I’m honest I’ll sew three, four times a week, and maybe two, three hours at a time. That that’s, that’s about it really. AD: What… Have you got… What projects have you got on the go at the moment? SM: Oh, I’ve got a lot of [laughs] UFOs, unfinished… [unfinished objects] I’ve got a quilt I’ve just started, that’s a linen quilt, and it’s proving to be a bit difficult ’cause it frays; that’s the trouble with linen. And I’m expecting my first grandchild this year so I’m looking forward to starting a, a little cot quilt. But… And I’ve got a Christmas project that I didn’t finish for Christmas this year so I’m going to finish that for next [laughs]. SM: We’ve got one, Gate Exhibition is this year. The date yet hasn’t been given to us but it’s this year, it’s summer. It’s usually around about June, July, so when we get back… it starts next week for me to go back this term and then we’ll all be told when it actually starts. AD: And what will it involve for you? SM: Well, we all, we all take in turn to do all sorts like selling raffles, but I seem to le-en… end up in the kitchen [laughs]. I don’t mind that because it’s busy, and I am a busy person so you’re on the go the whole time. But it could be anything. If they’re a bit short for someone stewarding I’ll do a bit of stewarding, or if it’s raffles I’ll do, do raffle selling, but mainly I’m in the kitchen doing the lunches and the cakes [laughs]. AD: And will you have to make any quilts specifically for the festival? SM: … it’s getting impossible really to do one every s… every second year, so maybe it might be just a couple of cushions. But yes definitely try and get something to put in every time. Yes you have to if you’re in a group and you’re putting on an exhibition, and you’ve got ladies coming from far and wide to see this exhibition, you’ve got to make sure you’ve got enough in there to hold their interest. And we always have very good comments so we’re always delighted. AD: How many people are in your group? Could you tell us a bit more about your groups? SM: St Blazey Gate I think now we’re sort of around 50. There was a waiting list at one time but at the moment I think we’re fine, there’s not a waiting list, ’cause as members get older they sort of for one reason or another they give up. We’ve had a few ladies with illness. We meet every Wednesday, and you don’t have to come every Wednesday. Sometimes you can just come and have a chat, just show someone a fabric you’ve bought or discuss something with someone, ask them for advice, there might be someone there that knows something that can help you with your next project. So it’s a very… they’re very friendly groups, that’s what’s so nice, and both of them are like that. Mevagissey group, which is Harbour, they’re exactly the same but they’re… they’re much smaller. I think we maybe… at the most thirty. But then I’ve got to say, we’re not all quilters. Some of them, some of them are ladies that have lost their husbands, and maybe they just want a bit of friendship and they know someone else that comes to quilting and they come along and they sit and they knit, or do cross-stitch. But that’s fine with us in that little group because it’s more of a friendly little thing and that’s for about two, three hours once a week in the morning, which is nice because we feel you don’t have to do patchwork to come to a patchwork group, if you want to do something else you can. And that’s led on to a lot of those ladies that starting knitting now doing patchwork, which is which is lovely. In fact, one lady who was, in fact she was the local GP and she’s a local girl, she just thought we were mad buying this lovely fabric, cutting it up into little bits and then sewing it back together. She said, ‘You’re all mad! Why are you doing that?’ But she was very good at cross-stitch, absolutely amazing at cross-stitch, but then one day she said, ‘I’m gonna do some quilting.’ But she didn’t cut pieces up, she bought a whole cloth kit, which most people know it’s a… your size of the quilt that you want to do and the design is printed on that, so all you do is batten the three layers together and then you fill in the, the design with whatever size stitch or thread you need to do. And she did do it and she was delighted with the finish, but she said she doesn’t ever want to do another and she’ll stick to her cross-stitch. But she did do it, and she does admire everybody else’s work so she just comes and does her cross-stitch, which is lovely. Lovely. AD: What would you look for in other people’s quilts? What do you think makes a good quilt? SM: I never judge them, Amanda, like that, because, I forgot to say earlier, I did go to workshops before Jo Colwill started at Launceston at Pepe and Daphne Turner who started the quilting, as far as I know, in Cornwall. And Daphne always had this saying, if you were a bit critical about your work saying, ‘Oh gosh, I didn’t do that very good,’ or, ‘my corners aren’t right,’ she’d say, ‘that’s not important. Once it’s quilted it will look fine, it’ll be lovely.’ And a lot of us that used to go to Daphne’s classes always say, ‘Daphne will say when we quilt it it’ll look lovely.’ So I don’t loo… I don’t judge anybody’s work, I just look at it as a whole and think, ‘That is lovely,’ and if it’s the first time they’ve done it and you can see there’s a mistake, it doesn’t matter, ’cause it’s the pleasure that’s given them and you can see it on their faces that they’ve achieved that, so it’s lovely, so I would never ever be a judge on anybody’s work. AD: Can you tell us a little bit more about Pepe and Daphne? SM: Yes. Pepe was a lorry driver, and… the first time I heard about them, and Daphne had started a little group up in Launceston and it was called Flowerpatch, and I’m sure everyone’s heard of Daphne and Pepe. And she had this little hut at the bottom of her garden and she used to make quilts. And she had a small number of people, six or seven I think, us to go once a week and she used to teach them and I think she was self-taught herself. And Pep was looking at these quilts and he said, ‘We could sell those Daphne, you’re really good at this.’ So what he did, he, when she would finish a few quilts, he, he would bundle them up and take them on his travels when he was lorry driving and call in in his own time and then call in to shops that he thought might be interested. And people w-were interested, and so they started selling quilts and that’s how it started. So then they bought… they moved from where they were living, moved into Launceston, and bought this property, where they had quilting upstairs and they taught quilting and they had little workshops, and downstairs they sold fabrics and threads and everything you needed, and on the side they had a café. So it was… And it was called Windmill and it was absolutely amazing and that’s how it started off in Cornwall. That’s, that’s how I heard about it. They were in the craft tent in the Royal Cornwall, and one lady saw it, she said, ‘Oh this is lovely.’ She went, ‘If you get 12 people, I’ll come to wherever you live and I’ll teach it,’ and that’s how it started, that’s how St Blazey Gate started, where I first went. This friend Jill, who, who started St Blazey Gate, Jill [Leicester], she rang Daphne and said… in fact she couldn’t get eight to start with ladies interested in it and so she put it on Radio Cornwall. And then some of her neighbours said, ‘Oh, I heard that. I’ll come to it,’ and that’s how it started. So then out of that Jill started St Blazey Gate group, and that’s how it grew, Amanda, where I first went. But Pepe and Daphne Turner then retired really, they went down towards St Ives, they had another… they had a workshop there and another little shop selling pieces, but then Daphne got into art, she got more into painting and art, and they retired from that. And I was very fortunate that when they were finishing they started to sell some of the work and my husband bought me one of Pepe’s quilts, and… which is lovely. And of course Pepe was the only man that we sort of knew that did quilts but then later on, reading in books, we realised there are a lot of men that make quilts and are very, very good at it. So that’s one of my favourite quilts that I treasure that was Pepe’s. SM: But that’s, that’s, that’s what Daphne you know always used to say, when these quilts are quilted they’re amazing. SM: Oh, golly. That was my son was, what he would have been then? I suppose that was mid 1980s for me that would have been. Yes, yes it would have been ’cause I think I did a couple of years there and then in ’89 I had another son, and I know I was pregnant at the time, so yeah so that would have been… so ’87, ’88, ’89 I was going to them at Launceston, I was yes, lovely. A lovely day out there in Launceston. 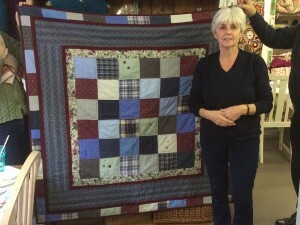 AD: So what do you see as the future of quilting, especially in Cornwall? SM: Well I hope it stays the s… like, like it is. I mean it’s got to grow and it will move on. You’ve got to go forward, I realise that. Far more modern things coming into it. I’d like to see more young people coming into it, that’s what I’d like to see, because I suppose the average age of our group I would say is 50s, 60s easy as one lady’s in her 90s. There’s about four I suppose might be in la… in their late 40s, early 50s, but that is the age group I feel. It would be nice to get younger ones come into it, especially in our area. Go to some groups, we visit some groups sometimes and they might have the odd young girl who’s doing textiles at college, then they get interested. So I just think to get the youngsters involved you know that’s, that’s the way forward I think. AD: Okay, thank you, Sue, for that.